IJTDirect are offering people 8 free printer deals, during this period which you have to buy their ink in order to get the free printer, I'm not sure if its worth it but it is up to people. The Offers are on the right of the website to click on and see what needs doing. 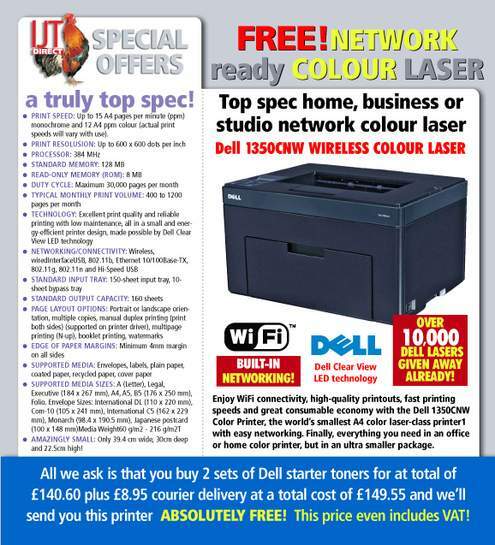 The deals are decent and I have an IJT supplied Dell printer which is excellent. but then I also have them ringing me up every two weeks trying to sell me toner with lies that grow increasing outrageous and insulting. They've been 'giving away' printers for years, you tend to pay a little more than you would for the printer on it's own, but instead of the OEM ink they give you some of theirs (which is how the trade off works). They also seek to gain further sales by calling you.. lots.. The promo code is not valid for printer hardware btw. You'll get lots of codes sent in the mail following your purchase. Their prices are not quite as good as they once were - so I would defo advise people to shop around before seeing this as a 'free printer'. They've been 'giving away' printers for years, you tend to pay a little … They've been 'giving away' printers for years, you tend to pay a little more than you would for the printer on it's own, but instead of the OEM ink they give you some of theirs (which is how the trade off works). They also seek to gain further sales by calling you.. lots..The promo code is not valid for printer hardware btw. You'll get lots of codes sent in the mail following your purchase.Their prices are not quite as good as they once were - so I would defo advise people to shop around before seeing this as a 'free printer'. Thanks for the advice for people. The deals are decent and I have an IJT supplied Dell printer which is … The deals are decent and I have an IJT supplied Dell printer which is excellent. but then I also have them ringing me up every two weeks trying to sell me toner with lies that grow increasing outrageous and insulting. I'm sure if you replied that the previous residents no longer live there, they would stop calling. thks for the link and further info peeps. Similar deals are offered on the Morgan site which IJT bought and operate. yeah these guys are awful with the harrassment. i even blocked their numbers (multiple, as they started using different ones when i blocked them) on my mobile, so they started phoning my home phone number, which i never give out so they must've got it from directory enquiries. pmsl - pay £140 for two sets of "STARTER" toners - i.e. 25% full compared to high density originals. 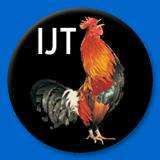 Icky ink, icky company - don't go chasing the printer manufacturers if your printer croaks because of the IJT ink. I was sorry to read your comments regarding my company. We have been trading for some 13 years now and service over 350,000 customers and are part of a large group (most customers happy), however, if not, please get in touch and we will attempt to resolve.